Best cheap balloon weight for a 4 feet balloon column with a 32" mylar balloon topper? I am planning a safari birthday party for my son's first birthday. 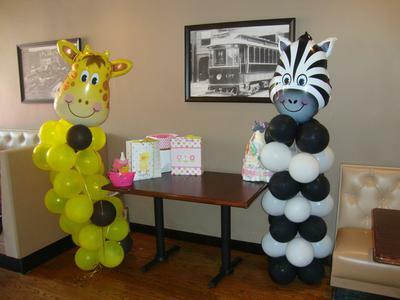 I am planning to make a balloon column similar to the one in the picture shown above (Source: http://photos.catchmyparty-cdn.com/photos/0071/1450/dsc09734_standard.jpg). What is the best cheap weight I can use for this? Will a sand filled balloon work? Is it best to use fishing line to tie the clusters together in the column? Or is using a 260 balloon a better option? I am assuming that you want to create the balloon columns with air-filled balloons, right? Then you can use either fishing line or natural twine for tying the clusters together. For the base, filling at least 2 of the bottom cluster balloons with either sand or water is one option. Another option would be to tie an aluminum foil wrapped brick to the bottom cluster as shown in the video below. To give the column an extra "lift," many balloon pros fill the top balloon with helium instead of air (but that increases of course the cost of the column). Good luck and I would love to see a photo of your balloon sculpture! Please pop by my Facebook Page and post it there after the party!